How To Decode the Markings on Motorcycle Tires | Hupy and Abraham, S.C.
A lot of numbers and markings are on the sidewalls of motorcycle tires. They each have a distinct meaning and will be helpful to you in determining which tires are right for your motorcycle. Having the right tires, properly inflated, is one of the most important things on your motorcycle to keep you safe. Do not take tires for granted. 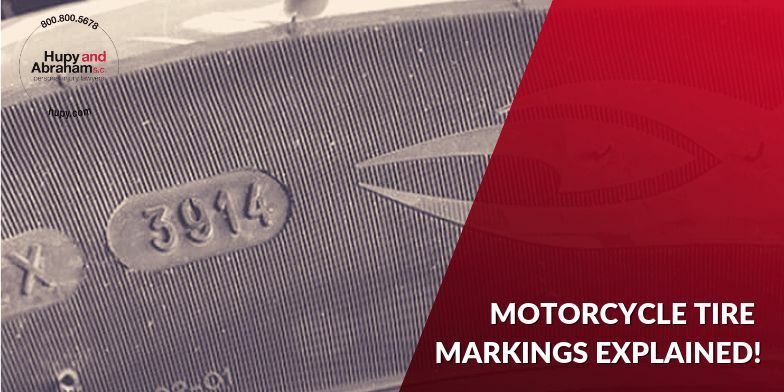 It’s important to understand what each mark or number means on a tire, but you should also consult with your owner’s manual before purchasing new tires. Despite fancy advertising, not all tires or tire sizes may be right for your bike or style of riding, be it sport, cruising, off-road or racing. Make sure you have the right style and size tire for your bike. Breaking down the codes on your tire signifies size, style, load and speed maximums, air pressure and more. Consider a tire with 130/90-16 MC 67H. We’ll use the metric system in our example. The first number is the width of the tire in millimeters (130). The second number is the height of the tire, compared as a ratio to the width. In this case, the tire height is 90 percent of the width, or 117 millimeters high. The dash after the height designates a bias ply tire. If the letter B appears, it signifies a belted tire, and an R means the tire is a radial. The number 16 in the sequence is the inside diameter of the tire (equal to the outside diameter of the wheel being used). This measurement is inches rather than millimeters. The MC designates that this is a motorcycle tire, and the 67H is the load and speed index. A 67 load index means the tire has a 667 maximum load rating. The H speed index means the tire is rated at a maximum of 130 mph. Load and speed index maximums are very important for you to consider when purchasing tires. The higher the load number, the more weight the tire can handle. If you ride a heavyweight, touring style bike, you’ll need a tire with a high load index because those bikes weigh in excess of 900 pounds. Proper load rating is important for safety, as well as for achieving better wear out of your tires. You can find the load and speed index charts by searching for them on the internet. 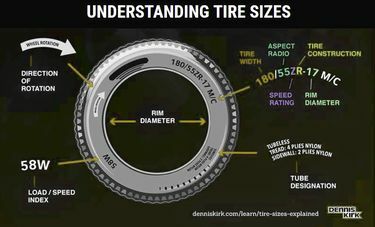 One good source that explains tire size codes simply is https://denniskirk.com/learn/tire-sizes-explained. On some tires, the speed index may appear before the construction type of the tire. For instance, a tire with 130/90 ZR16 MC 67 has the same width and height as the example above. The Z, before the letter R for radial tire, designates a tire capable of speeds in excess of 149 mph. Manufacturers will place the Z, the highest rating on the speed index chart, in this position. In the case of higher speed rated tires, you may notice a W, (W) or Y at the end of the sequence. These exceptional speed ratings are W, 168 mph; (W), 168+ mph; Y, 186 mph. Some other important codes to consider are the manufacturing date. According to some manufacturers, tires can be safe up to 10 years after production, but in reality, five to six years is the usual accepted shelf life of a tire. Therefore, before you buy that “super deal” at the swap meet, make sure you check the born-on date. Where do you find it? Look for DOT stamped on the tire. It’s usually followed by some letters and numbers signifying which safety standards it meets. The last four digits of that sequence give you the manufacturing date. If those numbers are 0917, it means the tire was made in September 2017. 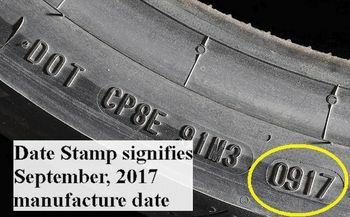 Obviously, if you find a tire with markings indicating it was manufactured six years ago or more, you should not purchase it. Tires produced prior to 2000 had only three numbers and definitely should be avoided. 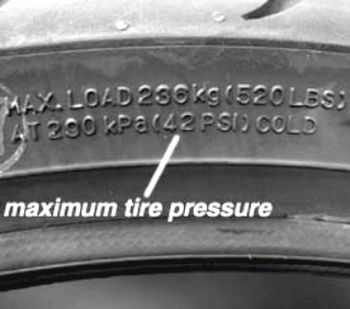 Another important marking on tires is the maximum air pressure. It will usually be combined with a maximum load number and the pressure is measured when the tire is cold. It does not necessarily mean you should inflate your tire to that maximum amount. One of the major causes of tire failure is a combination of overloading a bike and under inflating the tires. Consult with your owner’s manual for proper inflation of your tire. Also, make sure your tire’s rim diameter is proper. The wrong size rim diameter could result in a failure to properly seal your tire to the wheel. TT stamped on a tire means it’s a tube type tire, while TL means tubeless. If you notice some colored dots on your tire, those are manufacturer balancing marks. Usually white, green or blue, they should be aligned with the inflation valve when mounting the tire. Motorcycle tires will also have a position designation stamped on, alerting that the tire is either for the front or rear. 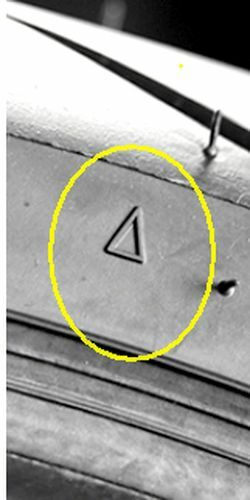 Another mark is a rotation arrow, designating the proper direction of rotation when the tire is mounted. This is important because tires are designed to grip wet pavement and direct water outward from the tread design. The tread is also designed to withstand rotational strain, so mounting in the proper direction is an important safety measure. Finally, locate the tire wear symbols. You’ll find them at the top of the sidewall, displayed as TWI (tire wear indicator) or a triangle symbol. Look between the tread at that location to notice tread wear lines within the tread design. If you see markings in the tread there, it’s time to replace the worn tires.